That feeling when you’ve paid off a big bill. 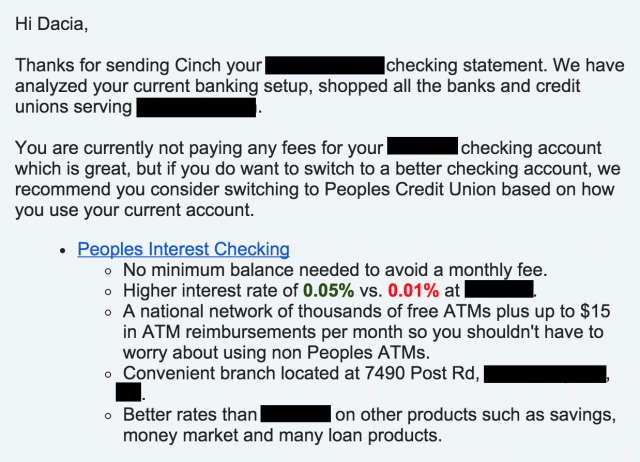 I just learned about a new site called Cinch Financial that helps people save money on their biggest monthly bills. Think cell phone bill, credit card debt, mortgage. This company focuses on the hard stuff because they believe that while you know how to cut down on everyday expenses (like giving up your daily coffee habit!) the big stuff can get confusing. What I love most about Cinch Financial is their Bill Snap feature. You send them the bill of your choice and receive personalized recommendations. Full disclosure: Cinch Financial is a beta test site. Bill Snap is in testing now as the company works on building an automated system to analyze financial transactions and create unbiased recommendations. Cinch Financial’s ultimate goal is that a user can sign in, link their accounts, and their automation system finds the key information, like our Cinch experts currently do with BillSnap, and produce savings recommendations that way. To test this feature, I sent in my bank account and credit card info as well as my boyfriend Derrick’s credit card bill. Since we have different credit carriers and vastly different spending habits I thought it would be interesting to compare Cinch Financial’s different feedback to see how personalized it really is. Honestly, I was impressed. The feedback we received was provided in list form and was sent to us within two days. It explained how we should adjust our spending habits and/or why we should change cards. 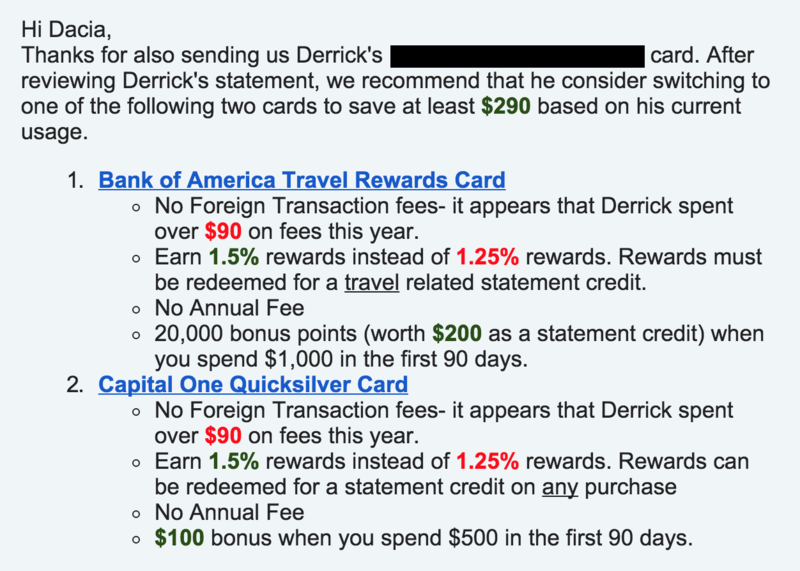 This analysis really made my boyfriend and I wish we’d researched foreign transaction fee free cards PRIOR to our trips abroad. Wow, those $1-$3 charges seemed like nothing at the time but they sure added up! I loved how they used data pulled from the credit card statement to show the benefit of these cards. The personalized aspect made us feel more certain about the need to change. 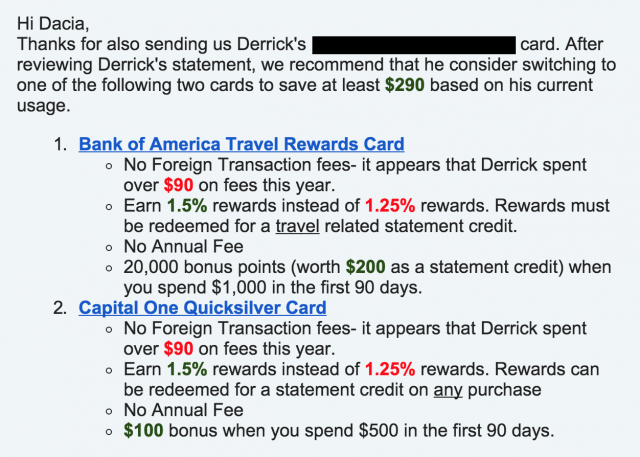 As a result, Derrick is planning to switch to the Bank of America Travel Rewards Card. 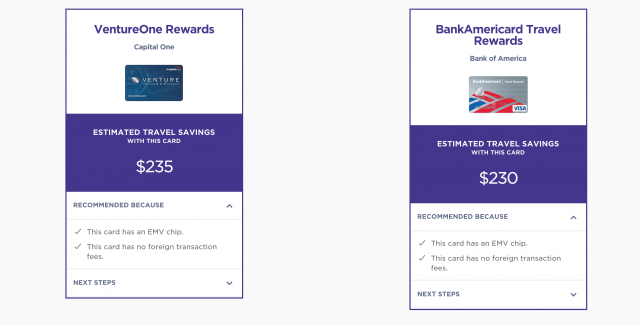 I always thought that my current credit card offered me great rewards, so I was floored when they showed me I could have an extra $35 just by switching to a different card. Also, I didn’t realize I’d even signed up for payment protection plan..ugh! While I’m not sure if I’ll be switching cards just yet I will be taking their advice and canceling the protection insurance. I love my current account because of the friendly local service but I will have to consider changing because of these benefits. 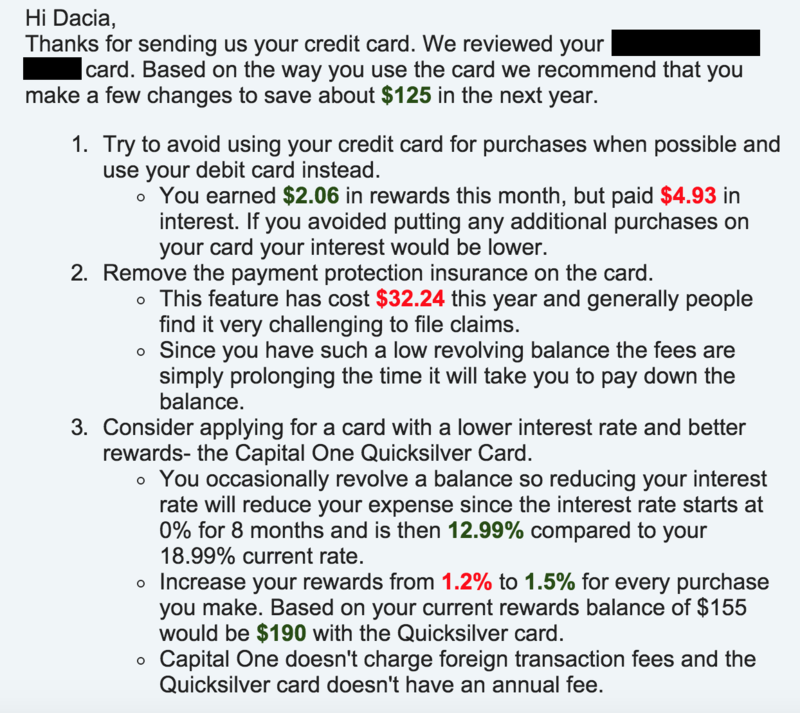 I didn’t realize Peoples Interest Checking offered a higher interest rate and ATM reimbursements. Why are you looking for a new credit card? How much do you think you’ll spend using the card each month? What kind of rewards would you prefer to receive? Do you spend more than $X each month on any of the following? What’s your estimated credit score? Then you’ll immediately receive your recommendations. Since I was looking for a card for travel I received these two recommendations. You can also click on each credit card to learn more about the benefits and compare them to your current card. This is a great way to learn about different cards BUT I wish there was a little more variety. Overall, I found Cinch Financial to be a very helpful resource. The questionnaires to access recommendations were quick and provided great advice. The Bill Snap feature is fun, new, and contained very interesting insights and personalized feedback. My only complaint would be that local recommendations aren’t always available which can be frustrating BUT you can get around this with the Bill Snap feature and since the company is still very new they are adding more locations all the time. Would you use Cinch Financial? 12 Free eBooks: Amazing Quinoa, One Condition, And More! Do I need some other added institution or business finding out my financial business? No! 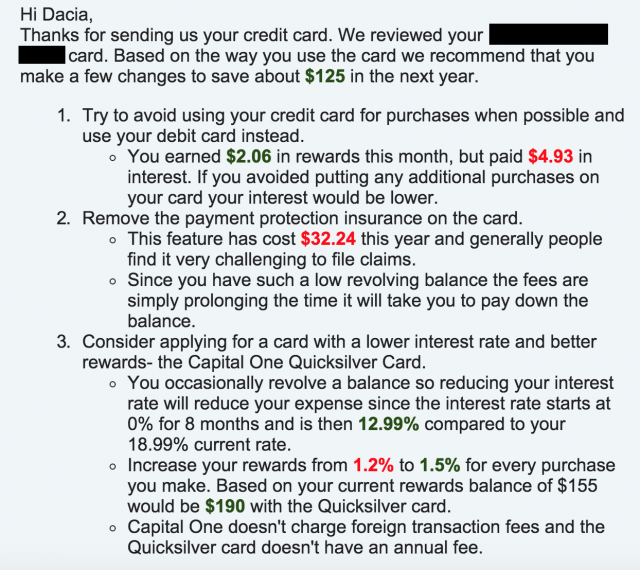 I have a 0% interest credit card and the card that has interest I pay off monthly….I don’t have reward cards and no added protection. Bare bones…….is the way to go…Most cell phone companies let you compare your monthly bill to what you’re actually spending and you can change plans….I turned to Consumer Cellular for that very reason. No 2 year plan and I can change it monthly if my usage goes up or down. If you were helped then I am happy for you! I’ll do my own research!